They say growing old is not for whimps and this August 21st is an opportunity to admire those who have accomplished it with flair on National Senior Citizens day. Whether someone you love has reached a ripe, old age or you’d like to brighten the day of a silver hair in your community, consider the comely carnation as the right flower to honor a person getting along in years. Said to represent both admiration, affection and pride in the language of flowers, it is the perfect pick for National Senior Citizens Day. Old fashioned, but never out of style, the carnation (Dianthus caryophyllus) has been cultivated by humans for at least 2,000 years. 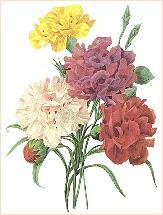 Rich in symbolism, the flowers of the carnation come in red, white, pink and now purple and yellow. Native to parts of the Mediterranean region, they have become one of the most popularly cultivated cut flower in floral design because of their hardiness and lasting ability in arrangements or bouquets- characteristics they share with folks who have made it to their golden years. The sturdy, silvery green stems hold up delicate swirls of soft petals which look fresh and lively in water for more than two weeks- long after the bloom is off the rose. Carnations come in a wide variety of sizes and colors. The dainty blooms of the mini carnations come 4 or 5 to a stem and are about 2 inches across. The larger, more stately carnations open up 3 to 4 inches across, so just a few go a long way in an arrangement or bouquet. As corsages and boutonnieres, carnations are particularly prized as they hold up well and add a welcome splash of color. Why not try making your own this Senior Citizens Day? Simply cut the stem about 2 inches below the bloom allowing a short stub to tie a piece of ribbon around. Stick a pin through the ribbon and pin on to a lapel or shirt to recognize a septua-, octo- or nonagenarian on this special day. Easy and fun, this gift is also very affordable, with a 10-stem bunch costing less than $6 these days. While they probably cost a lot less when these senior citizens were young, carnations are still one of the most economically priced flowers around. Getting old happens to everyone, but it still isn’t easy. Recognize the accomplishment this Senior Citizens Day with a flower that has the lasting power we all hope to have.